Real Property Management Salt Lake City, we guarantee to pay the cost of an eviction for a tenant we have placed in the property. It is important to use to help you accomplish your goals. You can’t focus on those if you are worried about a legal battle, collecting rent, or having to remove a tenant from your property. Going through an eviction can not only cost you thousands but it is incredibly time consuming. If you are choosing to manage your own property you often allow the tenant to get away with poor behavior and habits to avoid going through what inevitably has to happen. With this program we handle it all for you and help reduce your risk and give you your time and freedom back so that you can focus on what is important to you and your family! When you participate in RPM’s “Eviction Protection Plan” and a tenant fails to correct a lease violation leading to eviction, Real Property Management will pay the cost associated with evicting the tenant*. This includes court costs, filing fees, serving fees, attorney costs, sheriffs department, etc. Although a great investment, owning a rental property comes with some risk. Despite thorough screening of tenants, people can be unpredictable. Unexpected life circumstances are a common cause of evictions. The average eviction costs range between $600-$1500. Add the expense of lost rents on top and evictions can be even more costly. 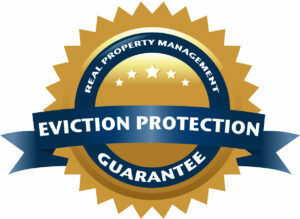 Real Property Managements “Eviction Protection Plan” guarantees you’ll be protected if the need arises. Let Real Property Management Salt Lake City take the risk out of owning a rental property. We let our performance speak for it’s self, and we guarantee it.